Nicolas Wagner has won a convincing victory in the Grand Prix Special today. With his horse Quater Back Junior he scored over 75%. The jury unanimously agreed that this combination had to win. 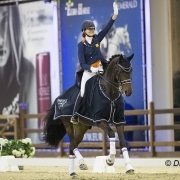 Fanny Verliefden and her Indoctro van de Steenblok gained a nice second place with a score of 72.638%. The half-passes to the right good be better according to the judges. The top five also includes Simon Missiaen with Charlie, Michelle Hagman meets Chagall H and Emma Hindle meets Romy del Sol. The last day of CDI Lier started this morning with the freestyle for the Light Tour combinations. Kristine Moller and the Trakehner Standing O’Vation TSF won the test with barely half a percent ahead of audience favorite Jorinde Verwimp. 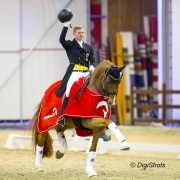 Verwimp missed with Kastar Hof ter Zeedycke D’12 the victory with 0,4%. The battle in the freestyle went between Luxembourg, Belgium and Germany. 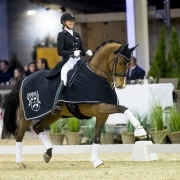 The victory went to Kristine Moller with the two-time World Cup finalist Standing O’Vation TSF. The daughter of Imperio got multiple eights for the extended trot, but also the flying changes scored high accourding to the judges. The beautiful freestyle was good for a score of 76.785%. 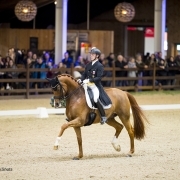 Jorinde Verwimp got 0.4% less for her freestyle with her Kastar Hof ter Zeedycke D’12. For the extended walk the Belgian got high points but also for the half passes. Verwimp amounted to 76,310%. Andrea Timpe ended third place on Don Carismo with 75.525%. Charlotte Fry had her international debut in the U25 class with the KWPN stallion Everdale in Lier. Unanimously, the pair was placed in the lead with 75.260%. Thalia Rockx was second with her Verdi de la Fazenda, just like in the Grand Prix. Also Fry her freestyle with Everdale went well. The stallion again impressed with his great passage that resulted in 8-th. The total came to 75.260% and the five judges had the couple unanimously in the lead. Behind Fry, Thalia Rockx had to settle for second place. In the piaffe-passage the duo came a bit too short. The five judges were also unanimous in their opinion, a second place with 72.210%. Just before that, Rockx had already won the Young Riders Freestyle with Gerda Nova de la Fazenda. The Belgian Alexa Fairchild was third with her Romy with 68.095% score. Thalia Rockx receives the first prize in the Young Riders Freestyles. 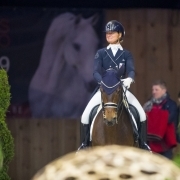 She managed to achieve a great score of 75.125% with her Gerda Nova (by. Romanov). The pair made a big impression in the artistic part and the canter changes. Rockx is so ahead of the Belgian rider Laura Luyten who managed to ride to a nice second place with a score of 73.083%. She counted on her J2l Lamborghini (by Bon Bravour). For Fabienne Jongen there is the third place with Botticelli (by Obelisk) after a score of 72.917%. The fourth place is taken by Anna Guseynova and Lauda, followed by a fifth place from Sophie Reef with Rue Noblesse. 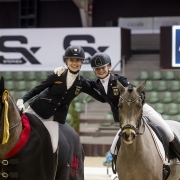 Suraya Hendrikx sent her Dear Friend 2 to sixth place with a score of 70.792%. The German Shona Benner claimed the victory in the freestyle at the pony’s with a score of 78.958%. With 77,250% the Dutch Micky Schelstraete followed with Elin’s Noncisdador in second place. 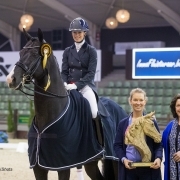 Benner won the Freestyle with Der Kleine Sunnyboy WE and took her third victory in a row. Schelstraete followed in second place with a lot of eights on her protocol. 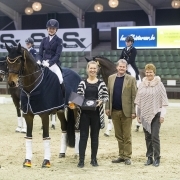 The third place was for Johanna Kullmann with Champ of Class. The German rider received 76,917% for her freestyle with the pony, which was in his earlier years also successful with Lisanne Zoutendijk and Sanne Vos. Lara van Nek ended with Baumann’s Despino in fifth place. The rider, who also finished three times in the Children, reached 73.500%. 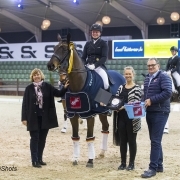 With that she was allowed to compete for the award ceremony behind Antonia Busch-Kuffner, who got 76.183% with Daily Pleasure WE and was fourth. The British Charlotte Fry wins the U25 with her Everdale (by Lord Leatherdale) with a score of 71.436%. 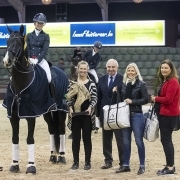 The second place was for Thalia Rockx from the Netherlands who scored a score of 68.128% with her horse Verdi De La Fazenda (by Florett As) The top three is closed by Alexa Fairchild and her Romy (by Rousseau). The jury gave them a total of 64.538%. Fourth is the Dutch Lisanne Zoutendijk. Together with her Kostendrukkers Watteau (by Broere Jazz) she got a score of 64.385%. British Ellen McCarthy ended up fifth place with her horse Belafonte (by Belissimo M). The combination received a score of 63.487%.